We will e-mail you an invoice to be paid through your bank. This manner of payment may take up to 4 working days. After selecting this option, you will be redirected to the 3D Secure site, where you will enter your card information to pay. Cash payments can be made at our branch at Bubenské nábř. 306/13, building no. 36, Prague 7 - Holešovice, no later than 5 days after signing up for a cooking class. We are open every work day from 9:00 am to 6:00 pm. Do you have a gift certificate from one of our partner benefit companies such as Benefit+, Benefity a.s., Adrop or other company? Select the correct company, enter the code and you’re done. After selecting this payment method you will be redirected to your internet banking. After logging in you will see a pre-filled payment order. Confirm this payment order and your payment is made. If you have any enquiries, please refer to the Frequently Asked Questions FAQ section on the main page or contact us directly at rezervace@chefparade.cz or call +420 730 155 087. ERROR: Reservation has not been sent. We have a special discount for you. Order 4 Gift vouchers, write 3+1 in the discount code box and you will get the 4th voucher for free! All you have to do while buying 4 vouchers is to use ”3+1” discount code in the order form. *Valid for vouchers of the same value. When was the last time you put a big smile on someone’s face and made them happy? Finding the perfect gift for your loved ones or co-workers isn’t rocket science. With our gift certificates for a wide variety of classes that special person will be sure to find something they like. Our gift certificates are not for a specific class or even person – they are fully transferrable and the holder can decide which class to take and when. We think of all the details so we even left a space on the certificate for your personal message. You can order gift certificates right here on this page, and to make payment easier you can choose from several options – cash, bank transfer, credit card or via vouchers. After payment is credited to our account we will send you the gift certificate by mail or e-mail. You can also pick up your gift certificate in person at our Chefparade studio in Holešovice (Bubenské nábř. 306/13, building no. 36, Prague 7). We are there for you every weekday from 9:00 am to 6:00 pm. Gift certificates are only valid for 6 months from the date of purchase. Before the expiration date gift certificates can be extended for an additional 6 months for a fee of 500 CZK. Note that once a gift certificate has expired it cannot be extended. Please keep track of the expiration date. The price of a gift certificate is 2,190 CZK. Gift certificates for children’s cooking classes are 1,290 CZK. In price is includes the consumption of drinks. Gift certificates for cooking classes can only be used at our Chefparade Cooking School in Prague. A decoration and practical accessory not to be missing in any home. 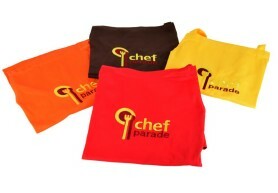 Choose from the following colors: red, yellow, brown or orange. Please write your color preference in the notes. Total length is 75 cm + neck strap. 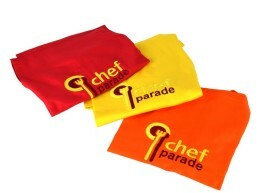 Every little chef loves their apron and moms do too when it comes to laundry. 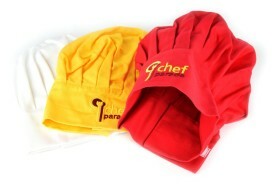 Choose from the following colors: red, yellow or orange. Please write your color preference in the notes. Total length is 65 cm + neck strap. 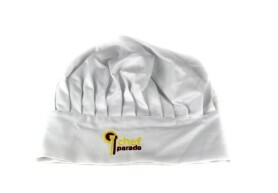 Keep your cool in the kitchen with this stylish white chef’s hat embroidered with the Chefparade logo. Size can be adjusted with the Velcro flap. Maximum circumference is 60 cm. Get your little helpers professional gear for the kitchen. They’ll be that much happier to help and will look good doing it. Maximum circumference is 50 cm, size can be adjusted with the Velcro flap. Colors: red, yellow or white. 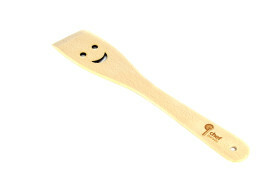 Our Chefparade wooden spoon can bring back fond memories of our cooking class. It’s like a magic wand, just keep it near whenever you are cooking and your dishes will be absolutely fabulous.